As veganism grows in popularity, with the meat-substitute market expected to reach $5.17 billion by 2020 and “vegan” Google searches increasing by 90% in 2016, so are plant-based diets for dogs. Vegans often find themselves facing a dilemma when it comes to choosing what to feed their companion animals, and with few studies available, it is still a topic of debate whether dogs and cats should and could be fed a vegan diet. Dogs are classified in the order Carnivora, but unlike cats, they are not obligate carnivores since they have evolved biologically as omnivores. Their systems can derive nutrients from a variety of sources like fruits, vegetables, grains, legumes, and animal products. They have even evolved to be able to digest starches 28 times better than wolves. According to the world’s first ever fresh, whole, plant-based, at-home canine feeding trial, conducted by Dogg Canine Nutrition Company, dogs can thrive on a plant-based diet. In this research, 20 randomly-selected dogs were fed a vegan diet for 12 weeks, and all of the dogs who completed the trial transitioned and adapted to their new diet without any issues. Some even improved medically while on it. Dogg founder, Laura Simonson, expressed that Dogg is not making any claims regarding the efficacy of a 100% plant-based diet for dogs since it is at an early stage and only their first trial, but she is confident that the next evolution to plant-based eating can be great for dogs too. During the trial, the most exciting improvements came from dogs with food hypersensitivity problems. For these animals who have consistent issues with their food, switching to vegan food could serve as a tool to manage these infirmities. Even though there is a lack of research, there is an abundance of testimonies and case studies that indicate that transitioning dogs to healthy vegan diets can result in increased overall health and vitality. In addition, there have shown to be decreased incidences of cancer, infections, hypothyroidism, ectoparasites, improved coat condition, allergy control, weight control, decreased arthritis, diabetes regression, and even cataract resolution. A well-known testimony is about Bramble, who was vegan and is one of the longest-lived dogs in recorded history (25 years). On the other hand, feeding a vegan diet to cats is a little more challenging, but not impossible. Cats are considered obligate carnivores, but they can do well on a vegan diet as long as it meets all of their nutritional requirements and their overall health is effectively monitored. In addition to the same nine essential amino acids needed in the diet of all mammals, cats require considerable amounts of Vitamin A, arginine, arachidonic acid and taurine, which unlike dogs and humans, they cannot synthesize from carotene. Insufficient amounts of Vitamin A may cause loss of hearing, as well as problems with skin, bones, and intestinal and reproductive systems, while the lack of taurine may cause blindness and cardiomyopathy. Even though taurine is abundant in animal flesh it is rare in plants. To counteract this issue there is a synthetic version of taurine that can be added to vegan cat food. In addition, there are veterinarian-approved supplements, like Vegecat™ and Vegekit™ that can be added to recipes in order to replace those naturally found in meat. Many vets who were once opposed to vegan diets for cats now admit that a plant-based diet is possible, claiming that even though the science is not yet settled, they have substantial research and empirical evidence on their side. Dr. Lorelei Wakefield, a veterinarian, and operator of Veterinary Concierge Care, is the author of the only peer-reviewed study on the health-related effects of plant-based diets for cats. During this study, Dr. Wakefield and her peers examined 34 cats on a managed vegan diet to see if they received enough of the essential nutrients, cobalamin, and taurine. They found that even though some cat’s nutrient levels were slightly suboptimal, none resulted in being technically deficient. According to Dr. Wakefield based on her experience, cats are, “…definitely no less happy and maybe happier on a vegan diet,” and while testing her vegan cat patient’s blood, she hasn’t found any deficiencies. A number of vegan dog and cat food brands on the market claim to meet feline nutritional needs and include guides on how to make the switch. Some companies that sell vegan dog and cat food are Amì Pet Food, F & O Alternative Pet Products, Harbingers of a New Age, Nature’s Recipe, Pet Guard, and V-Dog. There are countless success stories and testimonies from people whose companion animals have transitioned to vegan diets and have happy and healthy lives. 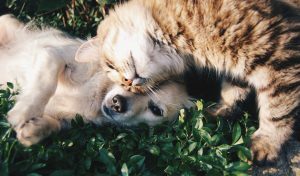 Commercially-available vegan diets have supported thousands of healthy vegan cats, dogs, and ferrets for many years; however, use of a nutritionally complete and balanced commercial diet or a nutritional supplement added to a home-made diet is vital to avoid nutritional deficiency and consequent disease. Positive testimonies and research results point to a bright future for vegan canines and felines.